Toshiba TEC has launched a new range of high-quality A4 colour printing systems. The range includes four multifunction products (MFPs) – the e-STUDIO338CS, e-STUDIO388CS, e-STUDIO389CS and the e-STUDIO479CS, together with the single-function e-STUDIO388CP printer. Toshiba is confident that these new systems will satisfy even the most demanding requirements for quality colour output and system performance. 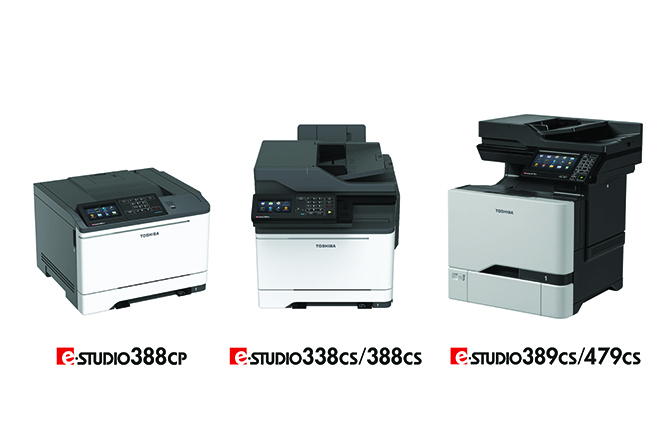 The e-STUDIO338CS, e-STUDIO388CS, e-STUDIO389CS and e-STUDIO479CS offer print, copy, scan and fax functions and are designed for easy, seamless integration into any office workflow making them an excellent choice for use in a busy document handling environment. The e-STUDIO338CS and e-STUDIO388CS can run a wide range of applications that further extend their versatility and usefulness. Rapid scanning of up to 94 images per minute supports the workflow of companies looking to digitise paper documents for easier storage and retrieval and the devices have an impressively short first-print output time of 8.5 and 8 seconds respectively. These models have a generous maximum paper capacity of 1,450 sheets. Like the other models in the range, the e-STUDIO389CS and e-STUDIO479CS provide a high print quality for text, graphics and images but they have even higher print speeds. These models have a maximum paper capacity of 2,300 sheets so that even the largest print jobs can be processed without interruption. They are particularly easy and intuitive to use, with their many applications and functions being accessed via a large 7-inch colour touch panel and keypad. First-print output times of 5 and 5.5 seconds respectively, as well as exceptional versatility, make these models a very attractive option for use in the workplaces where high printing productivity is a key requirement. As with all of Toshiba’s MFP ranges, these new models adhere to its low carbon footprint procedures, which minimise the environmental impact throughout the lifecycle of the device. In addition, any emissions produced as part of the procurement, manufacturing, and delivery processes are offset so the device is ‘Carbon Zero’ which allows for positive business activities with no detrimental effect on the environment.